Mumbai, March 14 (IANS) Actor Akshay Kumar is on a roll, and when is he ever not? 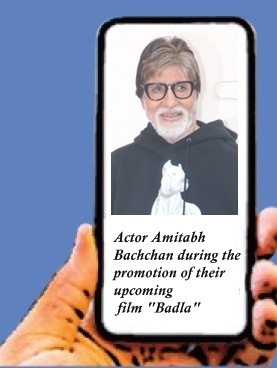 After signing up for a web series, the superstar is now getting ready for his next release "Kesari". He says he is happy getting a share of both the pies. Q. There is so much happening in your career. Your leap into the digital domain has created a nationwide stir. What made you take this plunge? A. Honestly, my son Aarav was one of the main driving factors for me to think in this direction and move into the digital space. It's where the youth is hooked onto and it is here that I wish to create something extraordinary and connect with them. It's going to be high octane action is all I can reveal as of now. Q. Do you think the future of the movie-going experience lies in the digital space? Or do you believe, as I do, that the magic of the movie theatre can't be eradicated? A. I'm of mixed opinion here. The actor in me would want and love to believe the magic of the movie theatres never fades away but having said that I'm also aware that a lot of content consumption is being done in the digital space and that is something that cannot be ignored. And if I can get a share of both the pies, then why not? Q. You had three major successes in 2018. "Kesari" is your first release for 2019, and it's looking like a blockbuster. What are your expectations regarding "Kesari"? A. "Kesari" is an extremely special film for me, my first war drama. It's a film I'm very emotional about. The answer on why I picked this film is in your question itself. I was amazed that such a brilliant and brave story has such little recognition and it's a story I'm really proud and excited about to share with the audiences. Q. In "Mission Mangal", you play a real-life astronaut. And there are several interesting female actors sharing the limelight with you. Would it be correct to say this is your first film in recent times where the women have important roles to play? A. I'd like to correct you here. In "Mission Mangal", I do not play an astronaut but a scientist and yes, I worked with an interesting mix of female co-actors in it. Well, it's actually very subjective and never been a conscious decision. I pick films which excite me. For instance, I was also a part of "Naam Shabana", where I most certainly wasn't the central character and my female co-actor Taapsee Pannu had a much more important role to play. So that's how it is. Q. "Good News" brings you together with one of your most constant co-stars Kareena Kapoor Khan. You also share screen space with Diljit Dosanjh, who is a huge fan of yours. What was it like working with them? A. Working with Bebo (Kareena) is always fun but Diljit and I get along like a house on fire, if I were to say so myself. Our Punjabi connect is amazing and I think it will show brilliantly on-screen. Q. You have played a number of real-life characters in recent films and I believe you are playing Prithviraj Chauhan in the future. How different is it to play a real character as compared with an out-and-out fantasy character like the one in "Housefull"? A. With real characters, you're briefed and taught about the characteristics and mannerisms. I wouldn't say it's easier but the scope is more defined whereas in case of fictional characters you have the liberty to bring your own to the table and add or subtract as per your will and add a touch to it. Q. Audiences have come to expect an Akshay Kumar film for Republic Day and Independence Day every year. But you've announced "Sooryanvanshi" for Eid 2020 which is considered to be Salman Khan's release domain. Please comment? A. It's a perception-created domain. With the number of films eyeing for holiday releases, we all just seek a less crowded window for release and Eid 2020 happened to be just that for "Sooryavanshi", at least for now. Fingers crossed.